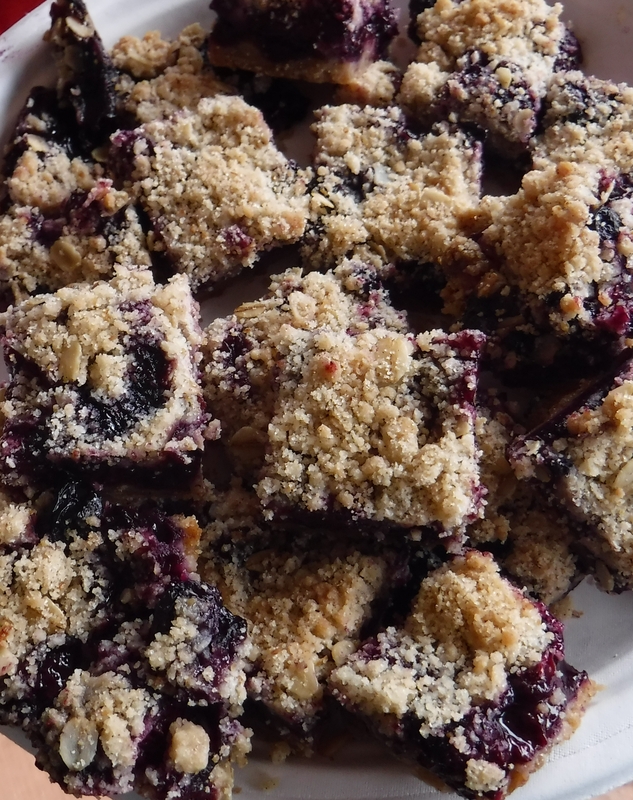 Wendy Hazen made these blueberry bars as a dessert over Father’s Day weekend and they were a huge hit. Yummy stuff. This is our second week of U-Pick and the berries look fantastic. I don’t know what kind of winter pruning magic Wendy and Wally have done this time, but the berries are larger, more abundant and scrumptious than I have yet seen. You gotta get out here and pick some of these berries. It’s quick and easy to fill several buckets and the berries are huge! Come on out! We also have pre-picked fresh raspberries in flats ready to take home and have fun with in the kitchen! 2: In food processor, pulse flour, the granulated sugar, cinnamon, zest, and salt until combined. ADD butter and vanilla. Pulse again until dough just resembles crumbs. Transfer 1/2 of the prepared dough to prepared pan. Place remaining dough in the fridge. Firmly press dough in your pan into a nice even layer. 3: In large bowl: toss your fresh blueberries, brown sugar, cornstarch and lemon juice. Spread berry mixture over crust in pan. Firmly squeeze chilled dough into small clumps and scatter over all the berries. 4: Bake 50 minutes to 1 hour or until topping is golden brown. Cool completely on a wire rack. Cut into squares. Makes about 18-24 bars, depending on size. Calories: 235 calories per bar: 2 grams protein, 34 grams carbs, 11 grams fat, 1 gram fiber, 140 mg of sodium. Let us know cost for u pick and already picked before we drive out….